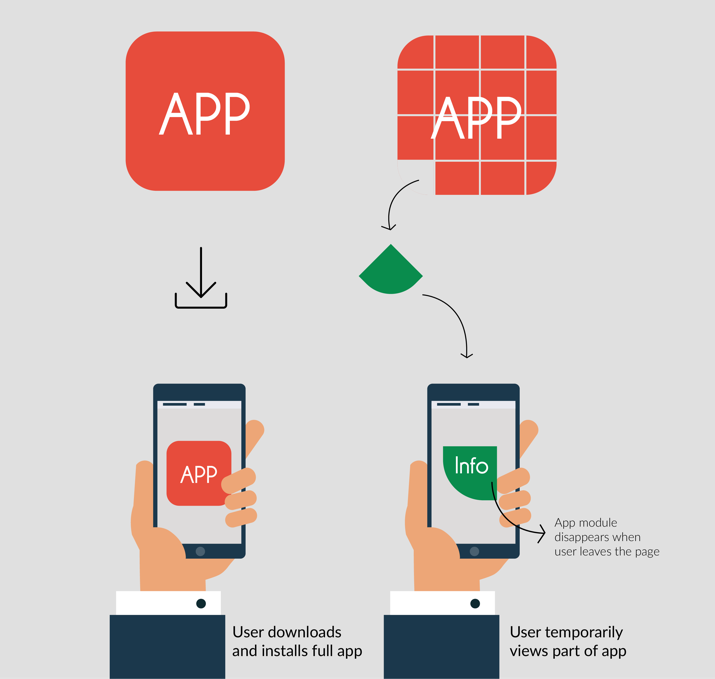 Instant Apps are a way for businesses to offer web users a lightweight version of their Android app without requiring a visit to Play Store and install it. These apps can be triggered by a simple click on a browser link, and the user would get the real app experience. These instant apps are in essence features of the main app, with each feature being a fully functional standalone app. (iii) Selecting your seats and paying for the flight tickets. These 3 functionalities can essentially be 3 different instant apps. So, if a user is searching for flights on a web browser, an instant app can be triggered to the user instantly. This will not only save the user time and effort, but also allow users to experience the native app of the business. Android Instant Apps allows Android users to run your apps instantly, without installation. Users can get to your native Android experience from any URL—including search, social media, messaging, and other deep links—without needing to install your app first. Android Instant Apps supports the latest Android devices from Android 6.0 (API level 23) through Android O, across more than 40 countries. Google will be rolling out support to more devices and countries soon, including expanding support to Android 5.0 (API level 21) devices. Android Instant Apps functionality is an upgrade to your existing Android app, not a new, separate app. It’s the same Android APIs, the same project, and the same source code. Using Android Studio you can modularize your app so that users load only the portion of the instant app that they need, when they need it. You don’t need to hire a new Android Instant App developer. When Google Play receives a request for a URL that matches an instant app, it sends the necessary code files to the Android device that sent the request. The device then runs the app. Users may need to enable Android Instant Apps to use it effectively. App download numbers can no longer be a metric to determine the success of your app. Now, more importance needs to be given to analyzing your core metrics rather than just app install numbers. The user behavior will change drastically as there will be multiple entry points into your app and users will be able to use your app without installing. Earlier : Play Store → Install → Browse → Purchase. Since users no longer need to download the app before using it, it becomes important to integrate analytics into your Instant Apps to measure user behaviour, analyze user flows that drive the most conversions, engage with these users accordingly and measure how these users and their behaviour are impacting your business. CleverTap integrates easily with your instant apps and helps analyze the performance of your instant apps.